They provide clues about our collective past, and are beautiful treasures of our region. Learn about the inventive builders of three such homes, and meet their current owners, dedicated to preservation. The beautifully restored living room inside the I.C. Bosworth House, Elgin. History goes beyond the written or spoken word, the fleeting, ephemeral memory of a person or event. It’s corporeal, solid, concrete. How much more meaningful, how much more alive, are such memories, when we can return to the place of their happening. Likewise, how much more meaningful, how much more alive, are communities’ histories, when we preserve the landmarks and structures of their happening. Many cities in the Northwest suburbs are preserving their heritage by preserving their buildings, and not just as museums. Historic districts abound, encompassing neighborhoods of private homes, guided by preservation committees whose members assist owners in research and restoration. 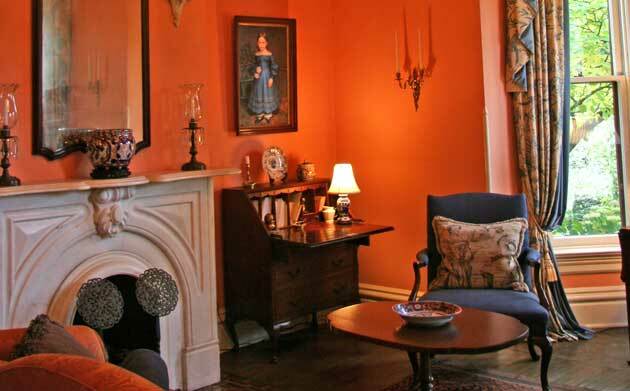 Here are the stories of three historic houses and their owners. While construction clogs the busy highways leading into Huntley, its quiet brick streets hearken back to its beginnings. In 2011 alone, eight historic homes were acknowledged with plaques by the McHenry County Historical Society, along with the town’s Dairy Mart, built in 1955. The Cook House, plaqued in 2009, was built in 1896 by the well-to-do Edward H. Cook, and the features reflected his status as co-owner of the hardware store; town pharmacist; funeral director; county coroner; village trustee; active member of Knights Templar, Freemasons, Oddfellows and several other organizations. The couple found one old photo of the house which they used to reconstruct the porch railing. From old paint chips, they determined that the house had been a light shade of green popular in that era, so they chose a sage green for the exterior. During the restoration, the couple tore off five layers of wallpaper and removed several coats of paint from the walls. They ripped up old carpeting – some of it shag – revealing beautiful hardwood floors downstairs. All of the window pulls, doorknobs, plates and latches, pushbutton light switches and transom window hardware were intact. The couple removed them, took them apart, restored each piece, and put them back – not as easy as it sounds. The couple did most of the work themselves. “I was buying and restoring old buildings in Chicago, so it wasn’t a new thing,” says Todd. With all they’ve learned, the Rutkowskis offer two pieces of advice for others considering the purchase and restoration of an historic home. “Be extremely patient,” Claire says. “And nothing is ever easy,” Todd adds. But, they say, it’s worth it. “The most satisfying thing is seeing the place come back to life,” says Claire. 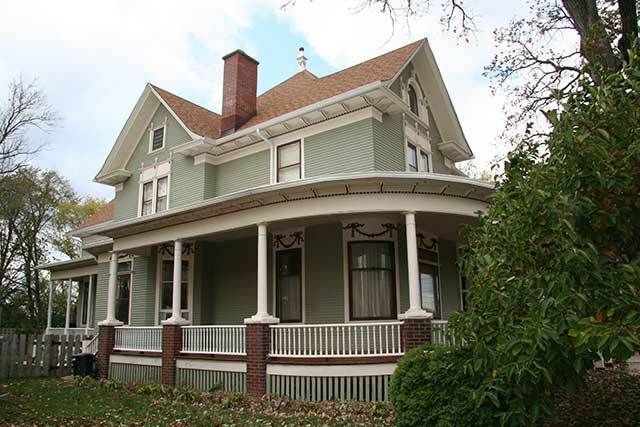 Established in 1834, Aurora today has 17 buildings listed on the National Register of Historic Places, as well as three historic districts. While its roots run deep, it has always been a progressive city. A lingering representation of that progressiveness can be found near Aurora University, in a southwest neighborhood which boasts a fair number of examples of mid-century modern homes. 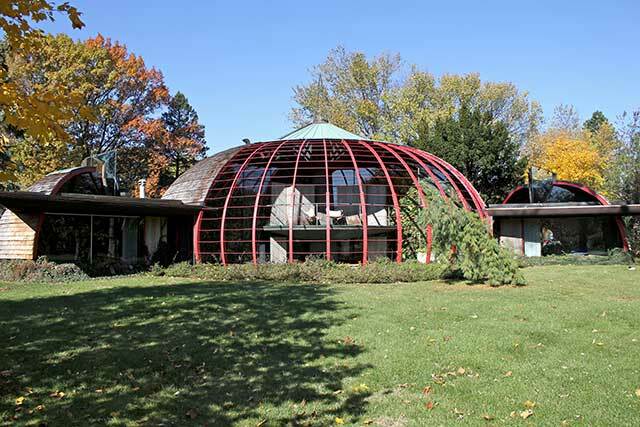 The most well-known is the round, Bruce Goff-designed Ford House, completed in 1951. Today, Sidney K. Robinson is its ninth owner, and he’s lived here twice as long as any of the previous owners. He purchased the home in 1986, and the only changes since it was built are new countertops and a new covering on the built-in circular seating around the fireplace. The house’s footprint is a 50-foot diameter circle, with two semi-circles on either the side, which serve as bedrooms – a total of 1,800 square feet. The entire west side of the house is glass. In the center, the patinaed brass fireplace chimney reaches to the top of the dome. An open second level is accessed on either side by a floating stairway. The structure’s curved orange steel ribs are visible in front only on the inside, and extend out into the backyard, forming a kind of open-air atrium. The curved walls are made of cannel coal, with large chucks of green glass cullet and various colored marbles inserted for contrast, color and light. Robinson himself is an architect who’s spent most of his career as a teacher and an author of books on architectural history. Retired from the University of Illinois at Chicago, he’s currently a faculty member at the Frank Lloyd Wright School of Architecture at Taliesin, in Spring Green, Wis. He bought the house because of his background. Above the coal wall is cypress planking, arranged in a kind of herringbone pattern which mimics the curve of the steel ribs. Fresh air comes in through ventilation louvers, installed behind wood trim where the wall and roof meet. Also here, for ambiance, is a strip of neon lighting, used because fluorescent tubes don’t bend. Robinson’s authentic mid-century modern home is filled with authentic mid-century modern furniture. “People ask me, ‘Are you a collector?’” he says with a wry smile. “I’ve never collected anything. I laugh and tell them, ‘This is the furniture I grew up with.’” He pulls out a black-and-white photo and lays it on the table in front of his fireplace. It shows a toddler holding himself upright on a table that holds a chocolate cake decorated with a single candle. Robinson has written several books dealing with organic American architecture, the movement pioneered by Frank Lloyd Wright; Goff was a follower of that movement, and the house is a concrete example. “It provides a context to ordinary life that causes you to be more conscious of everyday activities,” he says. “Even when it recedes, it’s still apparent, like cooking dinner in a circular kitchen. Elgin has eight individual buildings listed on the National Register of Historic Places, along with four historic districts and a golf course. This home was built by wealthy businessman Increase C. Bosworth, president of the First National Bank of Elgin, around 1875. 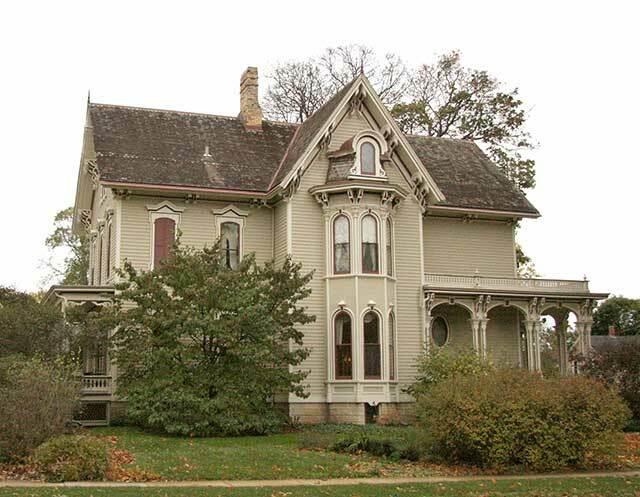 It’s located in Gifford Park, an active historic district named for Elgin’s founding father. Dan and Pat Miller, now retired high school teachers, bought the greatly altered, run-down Italianate-style home in 1986 and restored it themselves over a period of 12 years. They spearheaded the preservation movement in their neighborhood and instigated the house walk that’s now 30 years old. Dan had purchased an 1892 Queen Anne home in 1975, the year before the couple married, and Pat helped to rehab it. After they married, the couple continued to buy and refurbish antiques, even selling some at flea markets. “So we got into old houses, and we became active in the neighborhood association beginning in 1979,” says Dan. The house was far from its original condition. The finish was gone from the hardwood floors. Closets had been converted into small kitchens and bathrooms. False ceilings and extra walls had been installed. Outside, the ornate front porch had been removed and the exterior covered in stucco. The single, 300-amp, piggybacked screw-in fuse box demanded that electrical follow the roof. “We pulled 7,000 feet of new wiring through these walls,” says Dan. They could find no photographs of the house, but they researched in the library and at the county plat office and located lengthy obituaries in old newspapers that provided some detail. The wooden blinds in the sitting room were salvaged from a mansion in Marengo, and they fit to within an inch. Some doors, furniture, fixtures and trim are also salvaged pieces. Over 30 years, the Millers have restored three homes entirely by themselves, assisted with four in the neighborhood, and helped to salvage 60. Seeing so many splendid houses that had been stripped of their original trappings and treated poorly – staircases removed or walled off to create a multi-family dwelling, for example – was a driving force for the Millers. This entry was posted on Thursday, December 22nd, 2011 at 10:29 am	and is filed under Features, Top Posts. You can follow any responses to this entry through the RSS 2.0 feed. Both comments and pings are currently closed.